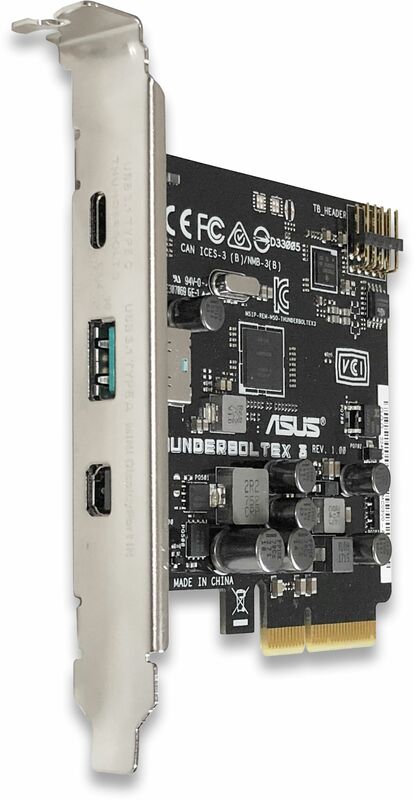 This clever little card allows you to connect multiple Thunderbolt devices in a daisy chain configuration to your PC. Alternatively, it can accommodate up to four full HD monitors. The ASUS Thunderbolt EX 3 PCIe card adds Thunderbolt 3 compatibility to your PC allowing you to achieve breathtaking file transfers of up to 40Gbps, which is twice the speed of Thunderbolt 2 and four times faster than USB3.1. The Thunderbolt 3 / USB3.1 Type-C port is also capable of outputting a display signal meaning you can daisy chain up to four monitors at 1900 x 1080 resolution. The card allows for multiple devices to be connected by daisy chaining them together. The image below shows just what is capable with Thunderbolt 3 connectivity. It shows six Thunderbolt devices and a single 4K display, all connected to the single Thunderbolt port. Please note that each device requires Thunderbolt in and out ports and the necessary cables to allow them to be daisy chained together. The card has a total of three accessible ports. We've already mentioned the Thunderbolt / USB3.1 Type-C ports above but it also features a standard USB3.1 Type-A port for connecting standard USB devices. There is also a mini-DisplayPort port which is used when a display(s) is connected to the chain. Included with the card is a mini-DisplayPort to standard DisplayPort cable. This needs to be connected to the mini-DisplayPort port on the card and then to a standard DisplayPort port of your output device. This can either be the onboard graphics or a discrete graphics card. Finally the "TB Header" is connected to the "TB_HEADER" port on the motherboard with the supplied cable. Thunderbolt support has to be enabled in the motherboard's BIOS. Please refer to your motherboard's manual for further instructions.